This is a classic flavor pairing that will satisfy any chocolate lover in your life, and I’m a firm believer that every cake maker should have a good chocolate cake and chocolate buttercream recipe up their sleeve. Whether you pair them together or use them separately to pair with other flavors, these are some great recipe staples. I’ve paired the chocolate buttercream with yellow cake and have paired the chocolate cake with tons of different buttercream recipes, some of my very favorites being almond, coconut, and raspberry buttercream. 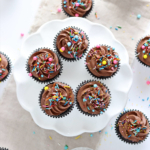 This cupcake recipe calls for natural, unsweetened Cocoa Powder, which differs from Dutch-Process Cocoa Powder mainly because of (you guessed it!) the process by which it’s made. Natural Cocoa Powder is made by simply roasting cocoa beans and grinding them into a fine powder, while Dutch-Process beans are first washed with potassium to neutralize the acidity before the grinding process. The potassium solution causes the Dutch-Process Cocoa to react differently in recipes that use baking soda (like this one! ), and although there are some recipes where Dutch-Process is the way to go, this one is better with the natural stuff. I use Hershey’s, but you can use any brand that doesn’t have the Dutch-Process label. 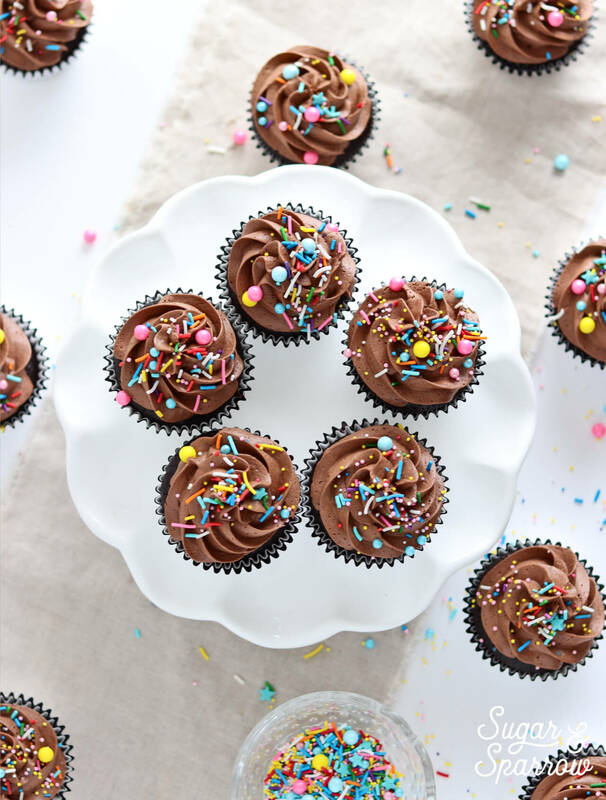 I’ve kept the decoration simple with these babies by piping a swirl of chocolate buttercream with my Wilton 1M tip, but feel free to get creative with the design. 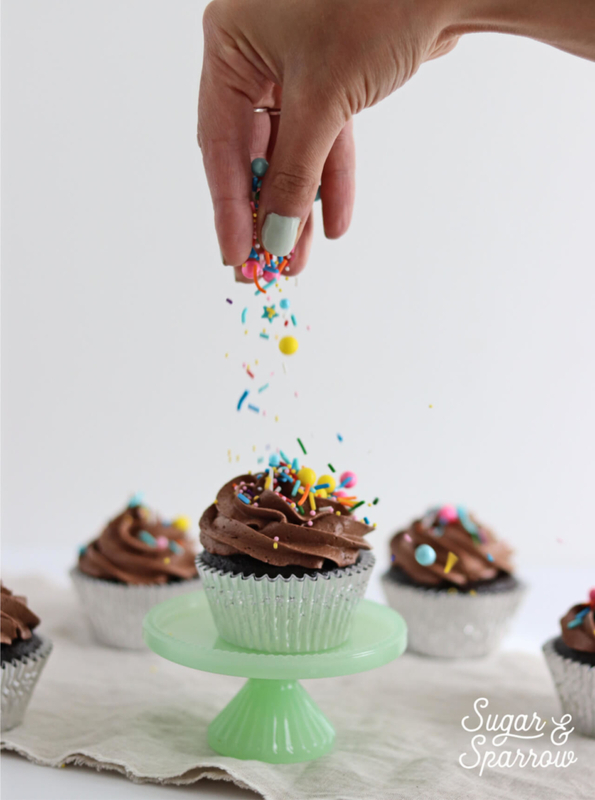 They’re made even more beautiful with these pretty sprinkles from Fancy Sprinkles in the Birthday Balloons mix. I just love the pops of color and texture they add! Side Note: One of my favorite birthday presents this year was this tiny glass cupcake stand you’re seeing in the photo above! Isn’t it the cutest thing ever? I’m a bit obsessed. 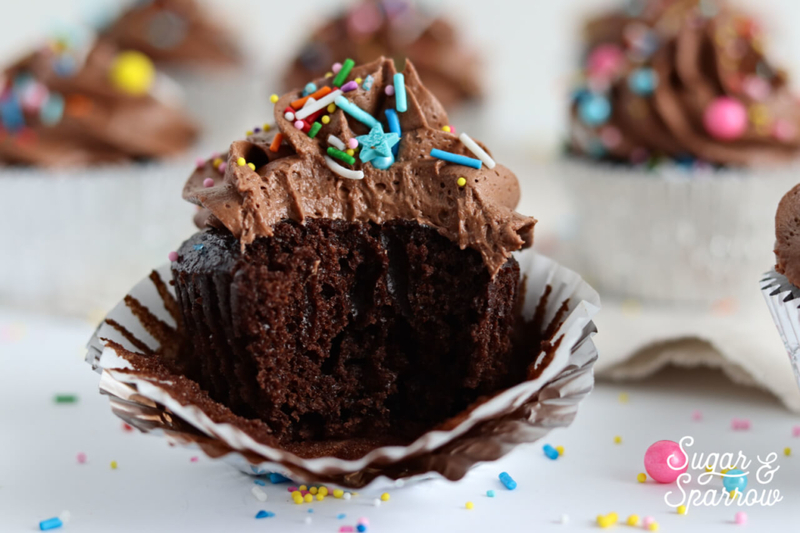 Rich and moist chocolate cupcakes topped with decadent chocolate buttercream. Preheat the oven to 325˚F and line a muffin pan with cupcake liners. Sift together the flour, cocoa powder, baking powder, baking soda, and salt. Place the sifted dry ingredients into the bowl of your stand mixer fitted with the paddle attachment. Add the sugar to the mixture and mix at low speed until blended. Add the vegetable oil and continue to mix until the mixture is crumbly, about 1 minute. In a separate medium-sized bowl, whisk together the eggs, milk and vanilla extract until blended. With the mixer at low speed, add the egg mixture to the flour mixture and mix for two minutes, scraping down the bowl and paddle as necessary. Slowly add the boiling water and mix until just blended and the batter is smooth, scraping down the bowl and paddle to ensure uniform consistency. Pour the batter evenly amongst cupcake liners, about ⅔ full each. Bake the cupcakes for 17 minutes, or until a toothpick inserted comes out clean. Let cool thoroughly before frosting. In a stand mixer fitted with a paddle attachment, whip butter on medium speed until creamy and light in color, about four minutes. Scrape down the bowl and paddle and turn the mixer to low, then add powdered sugar, cocoa powder, milk, salt, and vanilla extract. Increase the speed to high and beat for three minutes. Let the cupcakes cool thoroughly before frosting with chocolate buttercream. In the images above, I've used Wilton tip 1M to pipe a swirl with the buttercream before adding sprinkles. 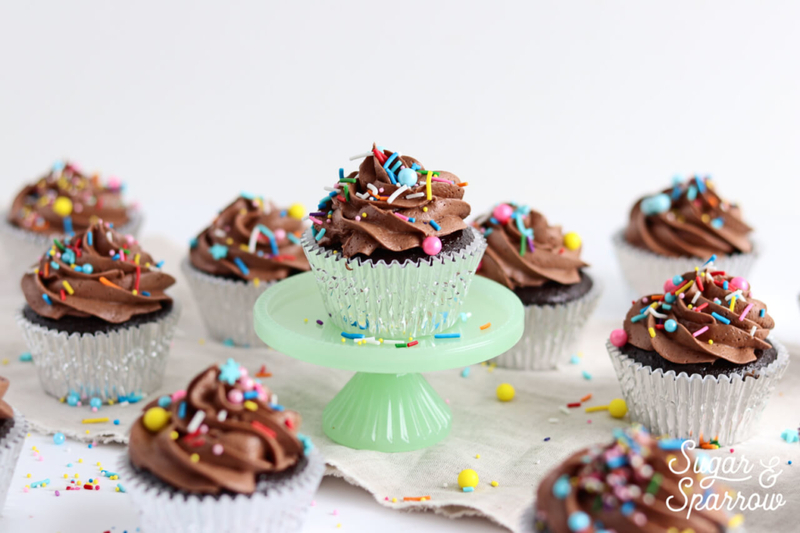 Make Ahead Tips: The cupcakes can be made ahead and stored at room temperature, covered with plastic wrap, for up to two days. Alternatively, they can be stored in an airtight container in the freezer for up to two months. The buttercream recipe can be made ahead and stored in an airtight container in the refrigerator for up to two weeks. 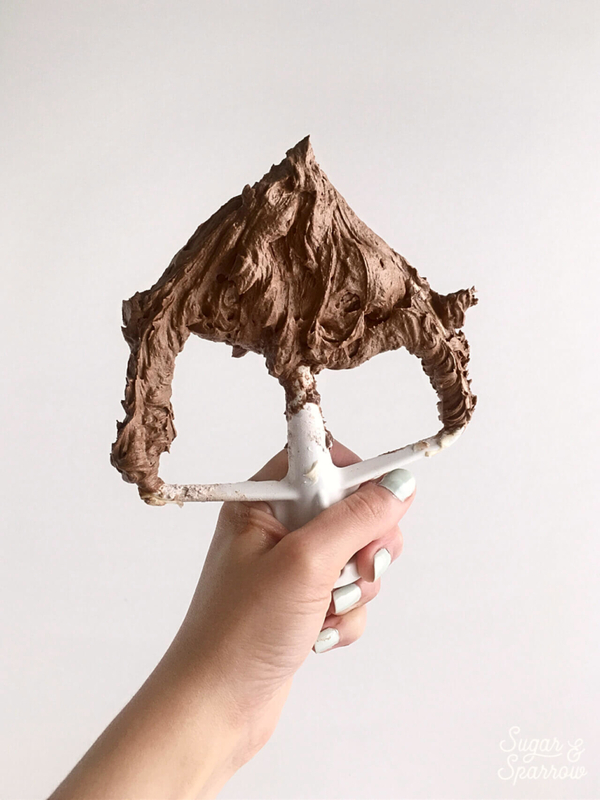 When you’re ready to use it, re-whip with your stand mixer. Question- after the cupcakes are made and decorated how do you store them and for how long? Hi Megan! If they’re for an order, I usually frost and deliver them the same day (or night before at the earliest and leave them in a cupcake box at room temp overnight). If they’re for eating, I often leave them out at room temp for 1-3 days and they last just fine. The frosting covers the cake enough to keep it moist/fluffy and the high sugar content in the frosting preserves the dairy and keeps it from going bad. Hope that helps! Hi Whitney, I love your blogs and cake creations! They’re very inspiring and reading your blog gets me excited all the time! Am looking for a decadent moist chocolate cake recipe. Would this cupcake recipe work for 6″ 3 layered cake? Would throwing in some dark chocolate bits make it more fudgy? Thanks!! Hi Janice! Thanks so much for the kind words about my cakes and blog posts! To turn this recipe into a cake recipe, I add 1/3 cup more white granulated sugar per batch. For a 6″ 3-layer cake, I would double the recipe and add an additional 2/3 cup sugar total. I’ve never tried adding anything like chocolate bits to it but I think that sounds delicious! Try it and let me know how it turns out! Thank you so much! Maybe this is a silly question, how does the additional sugar transform the batter from cupcake to cake? I made your vanilla cupcakes last week, and they were the BEST cupcakes I had ever had (retail or homemade). You’re a star!! The details in your blog is just stellar! Can’t wait to see more, and watch all your tutorials. That’s not a silly question at all! The additional sugar helps make the cake more moist and tender. When you spread batter over a wider surface (like a cake pan vs. a cupcake tin) I have found that in this recipe in particular, adding a little extra sugar helps yields a softer cake. I’m so happy to hear you loved the vanilla cupcakes!! Thanks so much and let me know how the chocolate cake turns out!